Healthy Children > Safety & Prevention > Immunizations > How Do Vaccines Work? To help you understand how immunizations work, here’s a little background on the body’s immune system and the way it functions. When your child becomes infected, his body relies on his immune system to fight the invading organism. White blood cells activate and begin making proteins called antibodies that locate the infectious agent and create a counter offensive. By this time, the germs may have already had time to cause a few symptoms. In some cases, the antibody response will be too late to be helpful and the invading organism can cause a severe or life-threatening infection. Even so, by going on the attack, the immune system and its antibodies can eventually help stop many infections and help your child get well. There's another important point to keep in mind about this process. Even after they've done their work, these antibodies don't disappear. They remain in the bloodstream, always on the lookout for the return of the same invaders. If these germs reappear, whether it's a few weeks or many years later, the antibodies are ready to protect. They can often prevent the infection altogether or stop the infection even before the first symptoms appear. That's why if you had the mumps or measles as a child, you never got it again, no matter how often you were exposed to the same infectious agent. Antibodies are pretty specific. If they've been created in response to, for example, the measles virus, they're not going to work against chickenpox. There are some antibodies that are not so specific and can protect you from similar types of bacteria. So, how does this scenario apply to childhood vaccines? The principle is very similar, even if the details are somewhat different. Immunizations rely on antibodies to fight off infections. But after a vaccination, antibodies go to work before a first infection develops. Here's how vaccines make that possible. Live vaccines are made up of a weakened version of the bacteria or virus responsible for the disease. Some vaccines are made from dead forms of the organism. These dead organisms were killed in a way to preserve their ability to provide immunity or protection. In other cases, an inactivated toxin that is made by the bacteria or a piece of the bacteria or virus is used. When the vaccine is given, the body's immune system detects this weakened or dead germ or germ part and reacts just as it would when a new full-blown infection occurs. It begins making antibodies against the vaccine material. These antibodies remain in the body and are ready to react if an actual infectious organism attack. In a sense, the vaccine tricks the body into thinking it is under assault, and the immune system makes weapons that will provide a defense when a real infection becomes a threat. Sometimes one dose of a vaccine is enough to protect a person, but often more than one dose is needed. Some antibodies protect for a lifetime, but others need boosting. For example, measles antibody lasts a lifetime, but antibody to tetanus can fall below a level that protects you, so booster doses are needed. Some viruses such as the flu can change enough to make the existing antibodies ineffective. That's why influenza vaccine is needed every year. By the way, newborns are immune to some infections because they've received antibodies from their mothers. But that immunity begins to fade in the first months of life. For that reason, it's very important to follow the immunization schedule that your pediatrician will recommend. 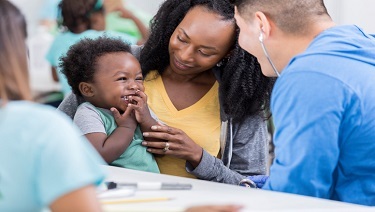 Also, keep in mind that children do not gain any immunity from their mothers against some of the infectious diseases covered by childhood vaccines―including whooping cough and hepatitis. This is another important reason to follow the American Academy of Pediatrics immunization guidelines.